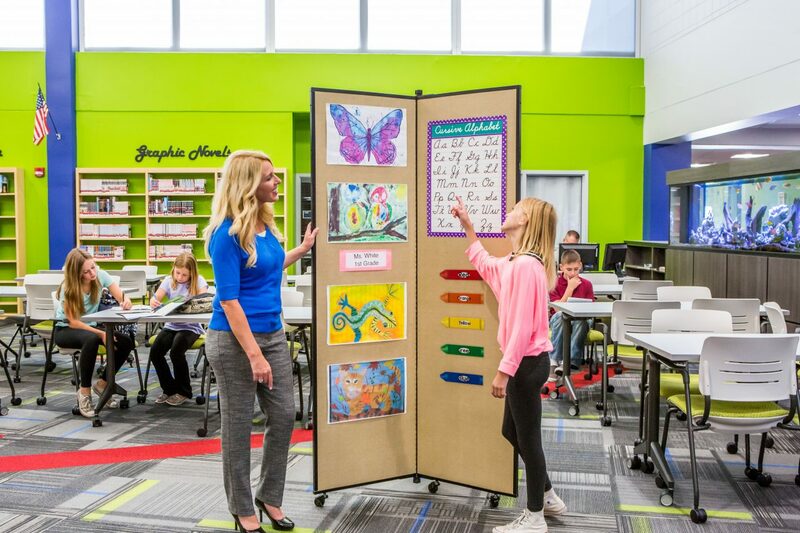 Uses: Bulletin Board, Elementary School, Library Colors: Browns/Tan/Beige Lengths: DT 3 Panel Display Tower Heights: 5'-9"
Schools and businesses are buying up these portable display stands. Why? Because they are so easy to use! Shipped flat, these dividers arrive fully assembled and ready to use. Three and six-panel options are available for your displaying needs. The 3-panel option provides you with 68 square feet of display space, while the 6-panel tower supplies you with 136 square feet of display space. Additionally, it’s easy to tack, pin or staple items directly onto the tower without damaging the fabric surface. Here’s vinyl clings are placed on the fabric panels for additional display options.